IT was a day of low expectation but in the end, it turned out to be one of pleasant surprises. 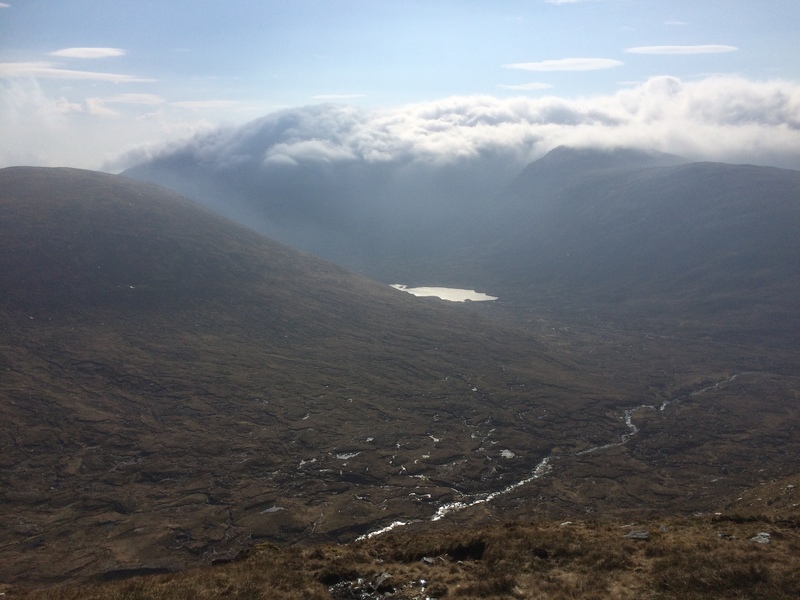 I had set off in the early spring gloom along a bulldozed track, the cloud sheet hanging oppressively low over Loch Merkland, an all-too typical Sutherland awakening. Ahead lay a short circuit of two rounded hills of modest height. It wasn't exactly a menu to inspire. Blue skies and sunshine had been left behind a few miles down the long road and I had risen and then descended into a landscape of dimmed russet and grey. The twin tops of the Corbett Ben Hee were buried somewhere off to my right as I passed the cut-off path into its heart and instead dropped down to the handy bridge across the waters of the Allt nan Albannaich. The initial ascent on grassy slopes was uninspiring, the oppressive conditions seeming to add weight to my footfall. But as I rose, so did the cloud base and the walking became lighter. By the time the terrain provided the first signs of rock, there was blue sky on the horizon, the grasses changed to a deeper shade of green and occasional pools sparkled and provided an unblemished foreground for scale. It's a long ridge rising at a gentle angle and the first summit, A’ Ghlaise, suddenly loomed into view, its double chin thrusting out from the face. Now the views opened out; the elegant curve to Carn an Tionail dead ahead, Beinn Direach across a corrie filled with sparkling rock and a silver snaking sliver of a river, while Ben Hee was beginning to wake from its slumbers, a bubbling, towering tsunami of white cloud, lit from below, cascading over its twin tops. 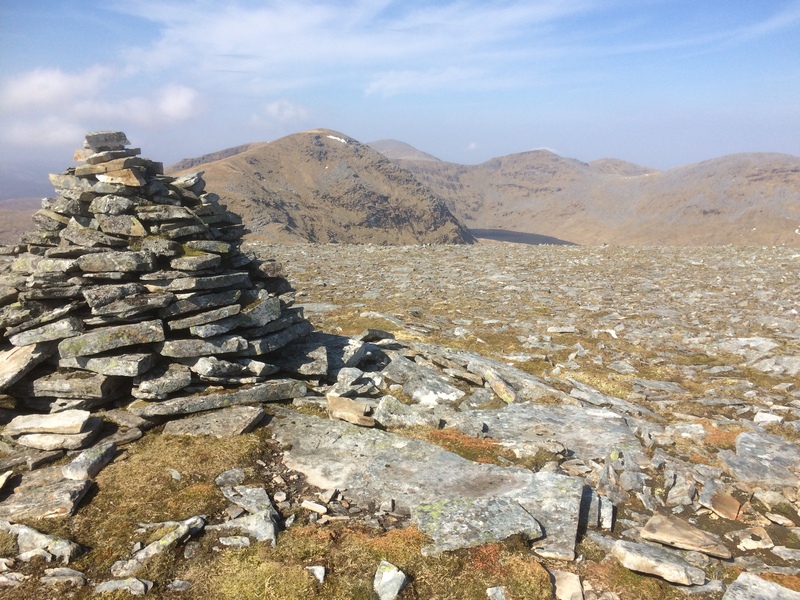 The summit of Carn an Tionail provides a fascinating glimpse into the heart of the complex topography of that tongue-twister of a mountain, Meallan Liath Mhic Dhughaill, a beautifully sculptured series of ridges and corries. The northern delights of Ben Hope and Ben Loyal were also prominent, if a little hazy, but the highlight of walk was still to come. The drop down to the Bealach nan Rath over clipped vegetation and clinking rocks is fast and straightforward but there the haste receded. This is a place you want to linger. A mix of stepped pavements, erratic boulders and pools of water, both in wind-scoured slabs and free-standing, brought to mind the corries of Skye. With the sun now beating down, it was the perfect place to stretch out for lunch and a bit of sun-worshipping with spectacular scenery north and south of this gap. This is truly a hidden gem, and I had it all to myself. 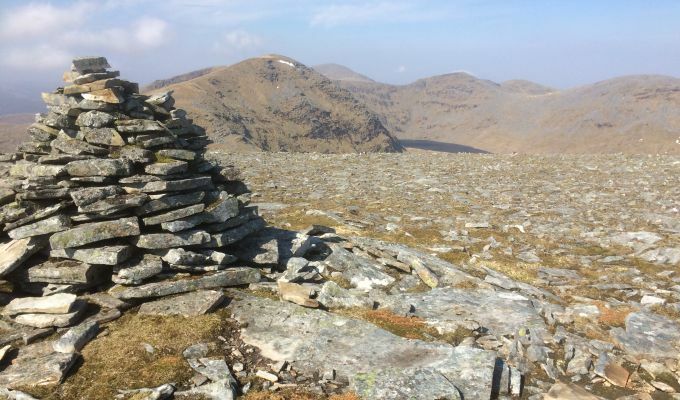 All good things must come to an end, however, and a short push brought me to the flat stony top of Beinn Direach and the final unveiling of Ben Hee, which had finally managed to completely shrug off its cap of cloud. From here, the descent is simple. If you fancy another summit, there’s always the continuation over Meall a’ Chleirich, but by the time you reach the col you will probably be tempted by the atv track that meanders effortlessly through the worst of the bog bringing you out to the track coming down from Bealach nam Meirleach, The Robbers Pass, an old drove route which connects with the incoming track. These are not honeypot hills. They are ones to be sought out, to be cherished for their solitude. I hadn't seen another soul all day but just five minutes from the finish I met a couple casually strolling in. I was almost disappointed – I had become selfishly jealous of my new discovery. There are some things you just don't want to share.